I spent a large amount of my time last year looking for a fly fishing destination in the tropics where I would have a good shot at the Grand Slam fish. I was drawn to Central America and South America as I have never been to that part of the world. I talked myself in to choosing Los Roques in Venezuela as a destination and then stumbled across an atoll off the coast of Belize called Turneffe. After further research I decided against risking the overnight stay in Caracas in Venezuela, and the Belize option seemed a lot safer! 30 miles South-East of Belize City lies Turneffe Atoll, a 36 mile long series of over 200 primarily sunken islands. Turneffe has two lodges that cater for anglers and we chose Turneffe Flats, who organised all the transfers from the airport to the lodge. There are no direct flights from the UK in to Belize City so you have to go via the United States - it is a 2 hour plane journey from Miami Airport to Belize City Airport. There is continual talk of British Airways introducing a direct flight from the UK to Belize City, and hopefully within the next few years this will become a reality as it will save a lot of time and money for UK visitors. From Belize City Airport we took the 15 minute transfer shuttle to the Princes International Hotel. 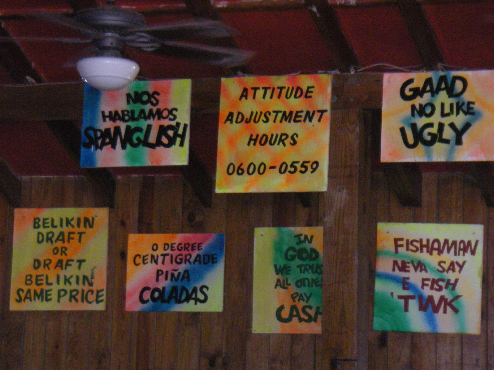 Next to the hotel is the locally run Calypso Bar where we sampled the local cuisine for the first time. The local cuisine is heavily fish based and draws influences from all over the world. We also enjoyed a liberal watering of the local Belikin Beer. We were met by Kevin at the Calypso Bar, where we also met with the four other guests who would be at the lodge during our stay (2 who were fishing and 2 who were diving). The transfer from the mainland to Turneffe Atoll takes between an hour and a half and two hours depending on the weather, the boat and the state of the tide. The Lodge is right on the edge of the water, and after walking out of our room we could take ten steps and be on the flats. Due to the jetlag (Belize is 7 hours behind London) we woke up at 4.30am on the first day and took a walk outside. We couldn't believe our eyes when we saw fish moving on the flats. As we hadn't fished flats before we didn't want to get our hopes up that they might be Bonefish but we set up a 7 weight with a couple of Turneffe Crabs and began casting at the nervous water. Within half a dozen casts I hooked in to something that took 50 yards of backing and then pinged off. Could it be that we had hooked the fish we had always wanted to? Another dozen or so casts later I hooked in to another fish which took another superb first run and finally landed my first Bonefish. We couldn't quite believe that within 15 minutes of waking up we'd caught our first Bonefish without any kind of guidance. We hoped it would be a good omen for the rest of the week! On our first day of guiding we decided to gain some confidence in the Bonefishing rather than try for the Permit and Tarpon. Our guide, Dion, took us across the atoll to some flats where we could find some good numbers of Bonefish to get some spotting and casting practice in. The only fish spotting I've done in the past is trout in rivers that were gin clear. Spotting the Bonefish on the flats was totally different. Rather than looking for the fish, you look for signs of fish, such as a the small triangle of the top of the tail protruding through the surface, or nervous water when fish move against the current, or muddy water produced from fish feeding in the sand. I was convinced there were no fish on the flats, but when Dion came over to spend some time with me he instantly started spotting fish, and even though he would say "10 o clock, 20 yards, moving to the left", I still couldn't see what he was talking about. However, a cast towards the direction he said resulted in a fish. As the week progressed we began to understand the tell tale signs of the Bonefish and we caught well. Towards the end of the days when we fished for Permit, we would spend an hour or so motoring along the edge of the mangroves and islands looking for larger Bonefish. Seeing big Bonefish right next to the mangroves was a bitter sweet pill, there was the lure of the big Bonefish, but the unfortunate fact that you get eaten alive by mosquitoes as you get nearer to the mangroves. 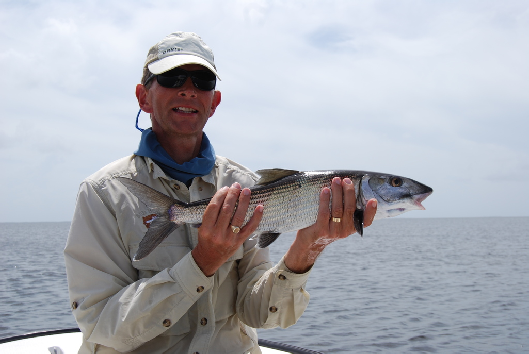 We caught Bonefish up to about 5 or 6lbs but they averaged about 2lb over the week. The fish gave an excellent account of themselves on a 7 weight and if it was a calm day and you could find a reel with adequate backing capability, I'm sure they would be great fun on a 5 weight too. 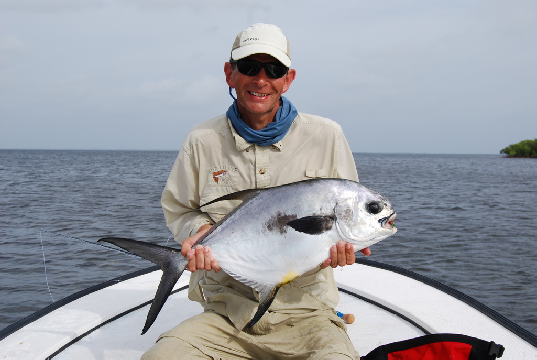 There are good numbers of Permit on the reef as well as out in the ocean, and many people return year after year to Turneffe just to fish for the Permit. Our guide told us of an angler who had tried every year over two decades to catch a Permit all over the world but had never succeeded. He came to Turneffe Flats and had 6 Permit in a day. Whilst we didn't quite match that success, we did have two fish each over the course of the week. Most of our time was spent in search of Permit. 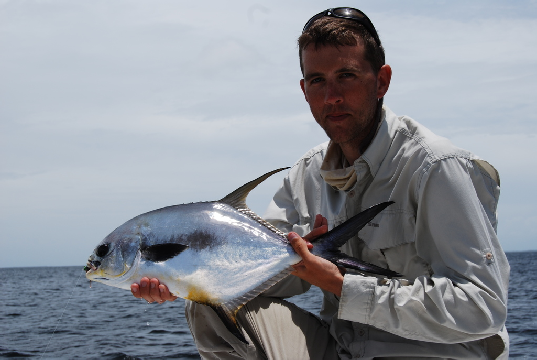 There were a couple of schools of Permit that worked up and down the mangroves. After catching our fill of Bonefish on the first day, we went looking for Permit. We found a shoal of about 50 fish and spent a couple of hours casting to them with a variety of crabs. The fish have an amazing knack of turning away at just the wrong time as they approach the fly, but they don't spook and bolt like other fish seem to. We were told that if the Permit started feeding near the mangroves they would a lot easier to catch than when they feed in the deeper water (10-15 feet). Unfortunately we never found the Permit feeding in the shallower water until the last day. Every cast became a silent prayer, and our fate rest in the hands of a group of fish who were moody. Fortunately those prayers were answered on three occasions. We finished the final day with three fish in the boat and another two missed fish. We only spent about four or five hours over the whole week fishing for Tarpon as we became so focussed on targeting Permit. Within our first hour of blind casting for Tarpon in a channel we saw a Tarpon roll further downstream so we pulled up the anchor and drifted down a little. I soon hooked in to the fish and the guide shouted to strip set the hook which I tried to do. He kept shouting to set the hook which I was convinced I had done and I lifted in to the fish. The Tarpon jumped once out the water and the hook flew out. I'll put it down to a distinct lack of experience in Tarpon fishing. Unfortunately I didn't get another chance to improve on my strip setting technique on Tarpon but next time the opportunity arises I will certainly be setting the hook a lot harder! Two other guys who were at Turneffe Flats Lodge at the same time as us spent the vast majority of the week fishing for the Tarpon. They jumped a dozen or so fish but didn't manage to land any. The Tarpon are on Turneffe from May through to about September. If the Permit and Tarpon aren't cooperating, or you fancy another fish to fish for at the end of the day, then Barracuda can be a welcome distraction. They are present both on the reef and out in the ocean. Whilst fishing for Bonefish one day we saw a Barracuda that was at least 6 foot long moving near a jetty but it had been spooked by our boat unfortunately. There are certainly big fish on the reef in shallow water, so you don't need to go off in to the deeper water to hook up with the big ones, but it does help! I had taken a few Needlefish flies with me on the off chance that we saw a Barracuda so we spent an hour or so casting to them on the reef. Whenever the fly was anywhere near the Barracuda the fish would almost certainly follow it. We had a lot of hits but the fish wasn't getting hooked. The hook was positioned right at the front of the fly, with the tail extending about 8" behind the hook, so all the fish were taking was the tail. The guide recommended we trail a hook at the end of the fly so the fish that hit the tail would be hooked. That was the changing moment for our Barracuda fishing and we soon began hooking up with more fish. 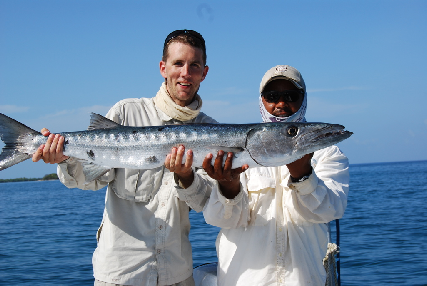 We caught Barracuda on the reef up to about 7 or 8lbs but when we ventured out in to the ocean we started finding bigger fish and had a Barracuda at 20lb and one at 25lb. We were perhaps a little bit undergunned with only a 7 weight rod, but we got them in to the boat ok. The only thing the rod lacked was enough lifting power to bring the fish up off the bottom easily, but we managed in the end! The speed of the Barracuda is incredible and the runs are powerful. They have a tendancy to jump as soon as they are hooked, and we had our 20lb and 25lb fish jump completely out of the water - an amazing sight. Big poppers also drew a lot of attention from Barracuda, but we couldn't get any to connect. Turneffe Flats Lodge has eight Beach Cabanas, a Reef Villa and a Garden Villa. We stayed in a Beach Cabana which has a double bed and a single bed. All rooms are air conditioned which is crucial in that part of the world! There is a central lounge where all the guests and staff meet after the activities for the day are complete, as well as for breakfast and dinner. All meals are freshly prepared and the menu has a nice variety in it that will suit most people. The cooks are very accommodating and will do their best to cook something if you don't like what is on the menu for the day. Even the bread for the lunchtime sandwiches is freshly baked. For those who don't fall asleep after dinner in the evenings there is a well stocked bar where you can enjoy an evening tipple before bed. A combination of jet lag and exhaustion from fishing and the sun meant that we were invariably in bed by 9:00. The upside of this was that we could wake up at 5am for an hour on the flats, or an early morning with our guide. The lodge has access to a large number of very knowledgeable and highly experienced guides who are brought across to the atoll when required. Belize is the only English speaking country in the region and as such there are no communication problems with the guides, as you might encounter in other venues. Our guide, Dion, was very accommodating with our fishing requests. We would discuss the plans for each day the afternoon before and arrange a start time. Starting at 5am was no problem for our guide, and we often exceeded the standard fishing day duration. The work that Dion put in during the week poling us around was superb. Regardless of the wind direction he was able to position the skiff in a position that allowed a good shot at the fish. 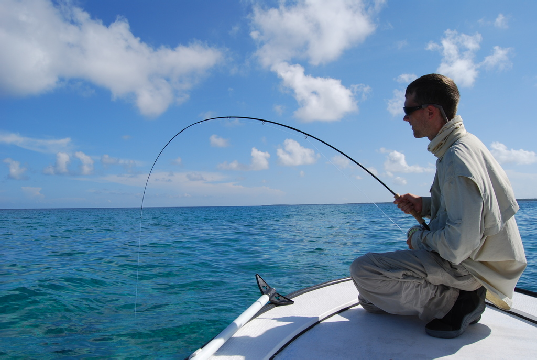 Turneffe Flats has a host of other activities for non anglers (or anglers who want a break from fishing) and in particular diving is a popular activity. A world famous dive location called The Blue Hole is accessible from Turneffe Atoll. There are dozens of other dive locations around the Atoll which give plenty of variety. Despite the strong presence of mosquitoes in the mangroves, Malaria is not present at Turneffe but we took anti-malarial pills (Avloclor) just to be on the safe side. Belize City has Malaria and even though the time spent in the city is minimal, it is better safe than sorry. The CDC (Centre For Disease Control And Prevention) still recommends malaria prophylaxis for Belize as well as a typhoid immunisation, but neither malaria or typhoid will be a concern to you unless you plan to travel elsewhere in Belize, and in particular the jungle. The typhoid injection is typically free from your local GP. You should consult your doctor for up to date immunisation requirements before travelling. If you are up to date with jabs then you have nothing to worry about, and there is no crime on the island so you can sit back and relax!